The weather in the last few weeks has been very changeable – for a while it was so cold and windy that it was difficult to plant. When the temperature is very low it takes the seeds a while to melt their way into the surface of the snow. If the wind blows them before they stick, they blow across the surface. I always worry that I’ll lose all my seeds on days like that, so I usually stop planting. It was very cold for about a week, and I only got a few sections planted – some days I couldn’t plant at all. But then it warmed up – it even got warm enough to rain. The last two days I planted it was so warm that I worked with no coat or hat or gloves on. In the warm weather the seeds stick to the snow as soon as I throw them down and I don’t get nearly as tired. So I got 8 sections done – that’s more than 2 acres – each day. I’ve now done 28 sections – nearly half done. The field I’m planting was a soybean field last summer, and when the combine went through it left lots of soybeans on the ground. It’s a good source of winter food for the deer, so there are tracks everywhere. 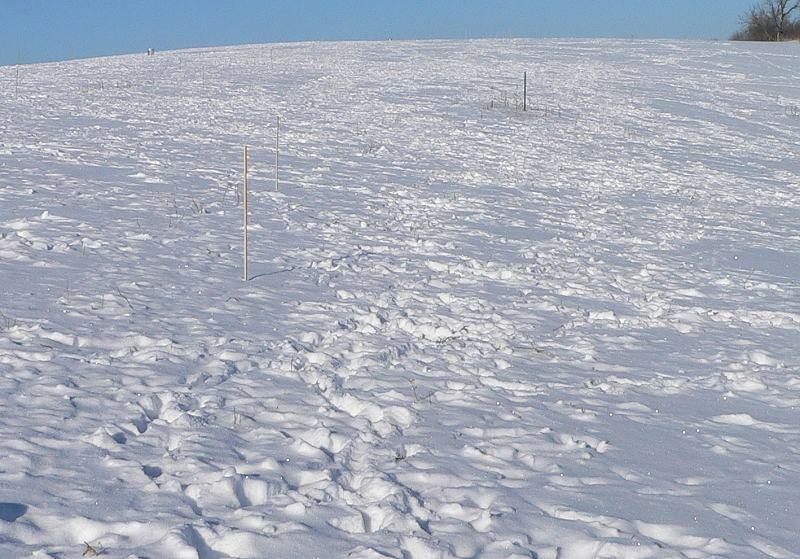 It’s more difficult to plant in areas where there are a lot of tracks – harder to walk on the bumpy snow, and in some areas the ground shows through which makes it hard to see where the seeds land. But sometimes I come to an area where there haven’t been any deer, and the snow looks like icing on a cake. That’s fun – throwing out the seeds makes me feel like I’m decorating the cake with sugar sprinkles – and it’s easy to get the seeds spread evenly. I noticed some reddish stains in the snow on the way up the hill. At first I thought it might be drops of blood from some small animal that had been killed, but then I realized that the stains were purple, not red, and that they came from some Wild Grapes (Vitis riparia) that had fallen into the snow. The stains and the grapes and the shadows on the snow make beautiful color compositions.